I haven’t been blogging much about reading lately. I go through phases where I read and read and read. My husband wonders why I don’t write my blog. Who is that woman curled up on the couch with a book? He thinks I should write something more important than a blog–like what?–but he knows this is my routine. Call it winter. All I want to do is read. And I am reading what is surely a contemporary women’s classic, Alice Hoffman’s The Museum of Extraordinary Things. Oddly, this got trashed in The New York Times Book Review. Katharine Weber, the author of Triangle, a novel about the Triangle Shirtwaist Factory fire in 1911, seems disgruntled by Hoffman’s fairy-tale-ish portrayal of the same events. Hoffman has a dreamy, poetic style that is completely different from Weber’s solid realism–and I also admired Weber’s novel. This is a strange instance, I think, of a bad pairing of a reviewer and a novel. How could there not be competitiveness here? In The Museum of Extraordinary Things, Hoffman interweaves the stories of two protagonists, Coralie and Eddie, who eventually meet and fall in love. Coralie is the daughter of the cruel owner of The Museum of Extraordinary Things, a museum of “freaks” (Siamese twins, dwarfs, giants, and the butterfly woman, who has no arms and fake wings attached) and gruesome artefacts he has collected or fabricated. He forces Coralie, who has webbed hands, to swim long distances in the Hudson River to prepare for a mermaid act in a tank. She is kept at home, so she will keep his secrets. The only people she knows are his employees; especially influential are the housekeeper who has raised her, Maureen, who has burns on her face from acid; and Maureen’s lover, the Wolf Man, a man born with hair all over his body, who was imprisoned for years in an attic by his family in Richmond, Virginia, and finally escaped, inspired by Jane Eyre. The other protagonist is Eddie Cohen, a Russian refugee, tailor’s son, and ex-factory worker who becomes an artistic photographer. He is also a photojournalist who pushes past the barriers when the Triangle factory is on fire and women trapped in a locked room jump from the windows. He eerily photographs this tragic scene. At first, the falling girls had seemed like birds. Bright cardinals, bone-white doves, swooping blackbirds in velvet-collared coats. But when they hit the cement, the terrible truth of the matter was revealed. Their bodies were broken, dashed to their deaths right before those who stood by helpless. A police officer near Eddie groaned and turned away, his head in his hands, for there was no way to save those who were already falling and no way to come to terms with the reality before them. The life nets being held out were worthless; bodies soared right through the netting. Many of the desperate leapers barreled onward, through the glass cellar lights embedded in the sidewalk, to the basements below. At her best, Hoffman writes gorgeously. The depth of her research about Coney Island and the Triangle factory, combined with her lyricism, makes this one of her most fascinating novels. Before this, my favorite was Second Nature, about a suburban woman who rescues a man raised by wolves. Don’t be surprised if this makes my Best of 2014 list (see sidebar). It’s one of those occasions when picking up a best-seller is worth it. I’m reading it now so I sort of read this with half closed eyes. I’m loving it. I think having spent so much time in Coney Island when I was a kid and my grandparents living during this period in NYC really adds something to it for me. I’m so glad I picked it up though I probably would have after I read your review. I couldn’t read her last book, though. It’s 1:21am and I’m going back to it right now. My bedtime reading. Pooh on Weber. She shouldn’t have done the review. I can’t remember if I read Triangle or not. I googled the fire when I got to that part just to see the photos. Oy. This sounds stunning and also terrible. And I wonder if she is drawing any parallels with 9/11? The pairing of reviewer and book is dumb – why put together people who are going to conflict? It doesn’t help the potential reader to sort out whether or not they’d like the book! Cynthia, yes, it’s always good to read a “review” with half-closed eyes before you finish the book. I often wait till after I’ve finished a book. Isn’t Hoffman wonderful? I’m way, way behind on reading her books, but this one is very good. I know the last one was a historical novel, and I admit I really like her magic realism, or fantasies, or whatever we should call it, so I wasn’t quite as interested in it as I might have been otherwise. Karen, you’re absolutely right about the references to 9/11. There is no way any of us can read this without thinking about it. Here the cruel managers kept the women locked into a workshop, and so they couldn’t escape. But all the jumping and falling… it’s the same. Hoffman makes us able to bear all this, I think, because of her poetry. I loved “The Dovekeepers.” Alice Hoffman has really blossomed these past fews years into a literary force to be reckoned with. 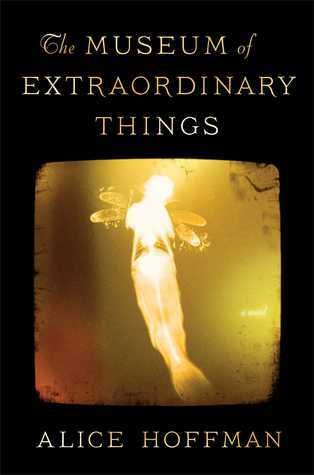 I read “The Museum of Extraordinary Things” and found it extraordinary, except that the love story seemed contrived. As far as reviewers go, the New York Times did the same thing to me with my first novel, “The Jewel of Medina,” assigned a reviewer who had a reason to be competitive, and who lambasted the book without ever really discussing it (she focused on the controversy). I don’t know whom the editors are trying to serve, really — certainly not readers who might really care about books. Sherry, I will have to read The Dovekeepers. I absolutely loved The Museum of Extraordinary Things–just finished it!–and disagree with the NYTRB reviewer’s accusation of “hackneyed” prose. So poetic, so moving: it made me understand exactly what happened, not just at Triangle, but on 9/11.Either an editor thinks he/she is passing on a book to an expert when giving it to another novelist who has written about the same subject, or is mischieveous (I hope not the latter). I am sorry that this kind of thing also happened to you! It probably happens much more often than we know. All are entitled to their own opinions, but, really, if I am noticing this kind of thing, others must, too. The Dovekeepers was my first of hers, and so, although I admired it greatly, I put off reading this one for some time because I feared it would be as painful and emotionally demanding (but, yes, so well done) as that story was. Instead, quite the contrary. Though not without harrowing bits, of course. My favourite parts were about her swimming in the river. It sounds like you loved this one more than I, but I certainly understand the strong appeal. And, without giving anything away, I thought she handled the ending very well, stopping when it did, and just affording a glimpse of the future (as fairy tales often do). I love Hoffman’s magic realism, and especially loved her early books. Then I had a ten-year hiatus when I stopped reading her because I wasn’t reading much contemporary fiction. Now I get to catch up, and loved The Museum of Extraordinary Things. The Dovekeepers I understand is completely different for Hoffman, but I rememver it got very good reviews.